Learn how to draw a beautiful jellyfish clipart filled with interesting digital effects so that this amazing cartoon character can look like the real thing (which is slightly transparent and / or translucent). However, before proceeding with this lesson, it can be a good idea to take a moment to study the character carefully so that we can prepare ourselves to create a better illustration. The head is made of two different shapes, one being inside the head and the other one is located outside. A large shape (created to illustrate reflection) is visible on the forehead of the animal. Eyes and pupils are made from small and large circles. Tentacles are represented by small and thin lines. The body is slightly thinner and a few lines are visible. 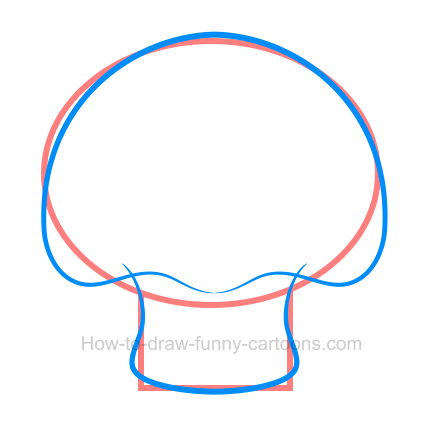 Don't forget to draw a big smile using a pointed curved line. Let's draw a large oval shape and a small rectangle to form the head and body of the jellyfish clipart. Using these two elements as a guideline, we can now proceed to the second step and start drawing the animal using curved lines. The head of the jellyfish is made from a long curved line that consists of a few additional curves that are added on the bottom of the shape. The body (located below the head) is drawn using another long curved line. Once you are done working on these two elements, you can erase both orange shapes created earlier. These weird creatures are gifted with several long tentacles that are attached below the body. 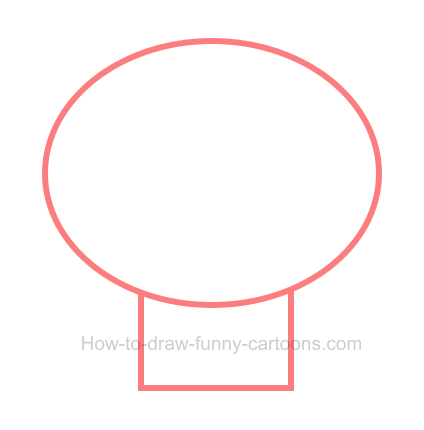 To create these parts, simply draw a few (long) curved lines as shown below. Make sure that the tip of each line is sharp and pointed. It's now time to work inside the head of the animal. First, you can draw the eyes and the pupils using small and large circles. The mouth is done with a long curved line. 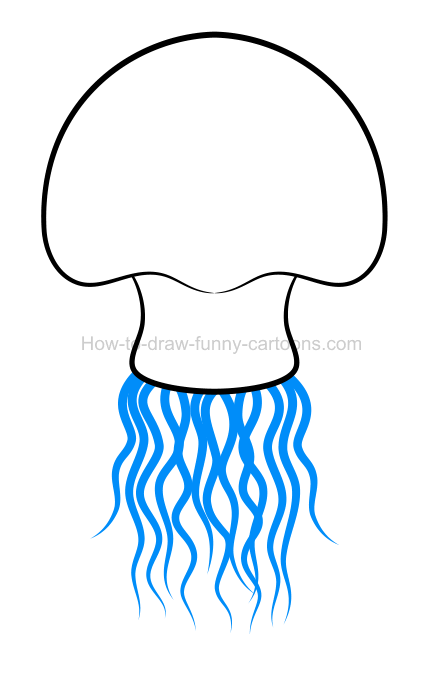 More lines are drawn on the body of the jellyfish to create a little bit of texture. You can select a wide variety of colors if you want to. In this case, I have created an adorable blue jellyfish. Pink or purple are also cool colors that can be used to represent this animal. 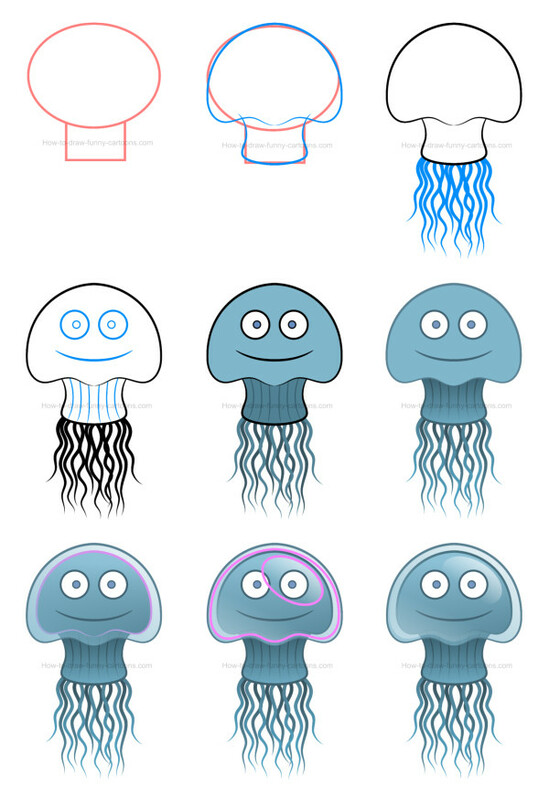 Now that the character is fully drawn, let's add some effects to make this jellyfish clipart visually more exciting. 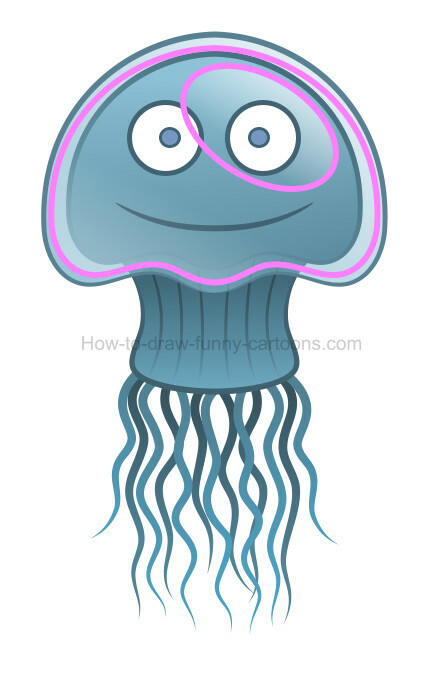 In this step, you can add gradient colors inside the body and on the tentacles of the cartoon character. No need to apply these effects on the head for now. If you compare the image below with the previous one, you can also see that all lines are now colored (instead of being black). step 7 - Time to create some transparency! Jellies are quite intriguing: these animals do have a transparent head. For this step, you can duplicate the head and place this one behind the original shape. Since the new shape is now hidden, simply make the large head transparent to complete the effect. This technique is clearly visible on top of the body. Duplicate the larger head once again and reduce the size of the new shape. This new element must be larger than the small head, but smaller than the larger one. Color this new shape in white and add transparency so that only the bottom part can be seen. You can also draw a large oval shape on the forehead and apply transparency on this other new shape. 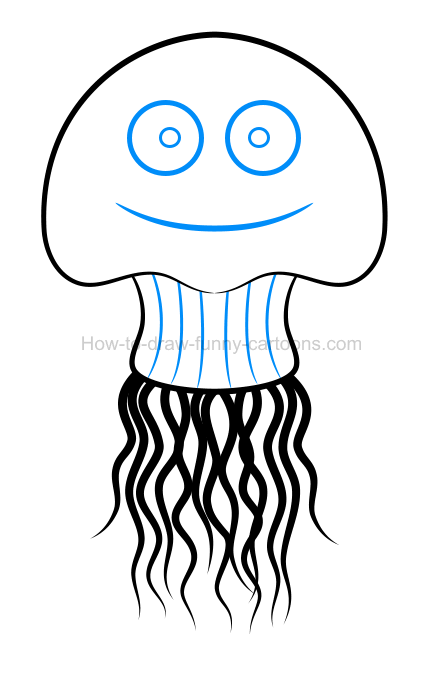 step 9 - here is the final version of our jellyfish clipart! Now that all effects are applied, you can see how the character should look like. 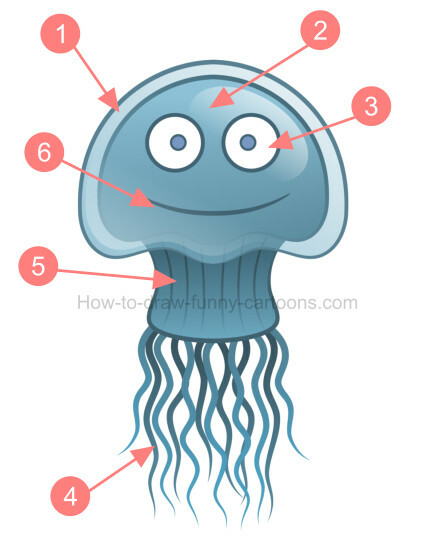 These simple tips are enough to help you draw a cool cartoon version of a jellyfish without the need to create something too complex of visually detailed. Nice work! Have fun with this character!